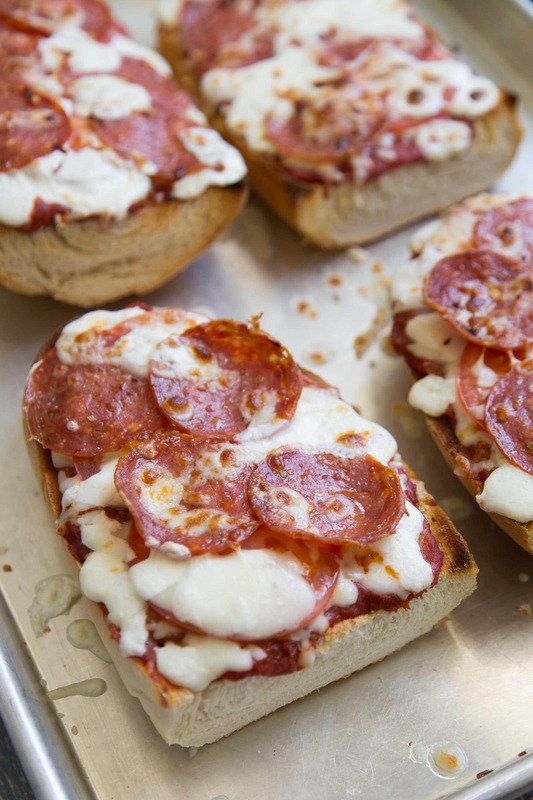 This quick and easy French Bread Pizza is an ode to my favorite elementary school lunch item. My love for pizza started in elementary school. Every Friday our cafeteria would serve French bread pizza. I thought it was the most amazing thing ever. It was cheesy, saucy, and oh so tasty. The crust was sturdy enough for me to hold the entire pizza in my little hands. I’d often return home with a joker-like stain of tomato sauce around my mouth. I was a voracious and messy eater. You should have seen my face on Sloppy Joe lunch days. Forget the frozen French bread pizzas of high school and college years. 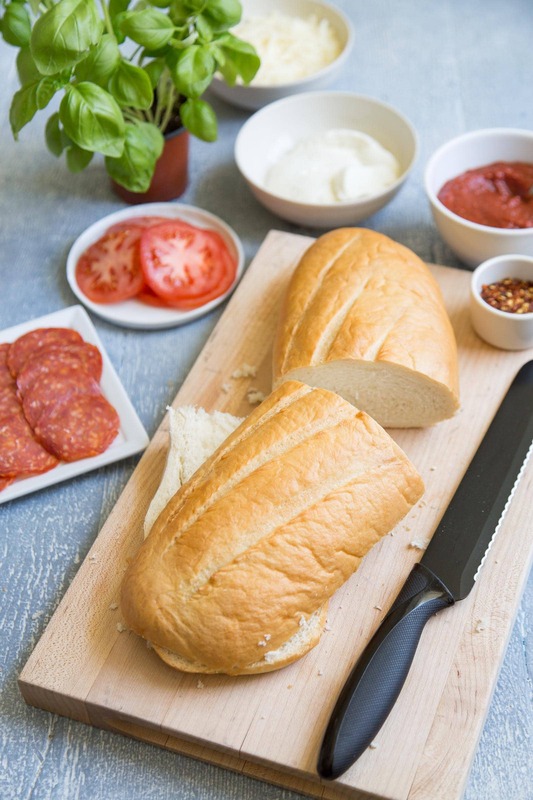 It’s unbelievably easy to make French bread pizza at home using store-bought French bread (or Italian bread, or whatever soft loaf of bread your market sells). Using the broiler setting of your oven, it only takes minutes to have a hot, bubbling, saucy French bread pizza in your hands. Slice the bread in half lengthwise and crosswise until you have four equal pieces. Place the bread cut-side up on a baking sheet and set it under the broiler for 30 seconds or so until the bread is nice and toasty. This helps to give the pizza some structure and crunch. Top toasted bread with pizza sauce (this one is my favorite! ), shredded mozzarella, sliced tomatoes, pepperoni, and crumbled fresh mozzarella. Fresh mozzarella is key. That’s how you get pockets of that ooey-gooey cheese pull. 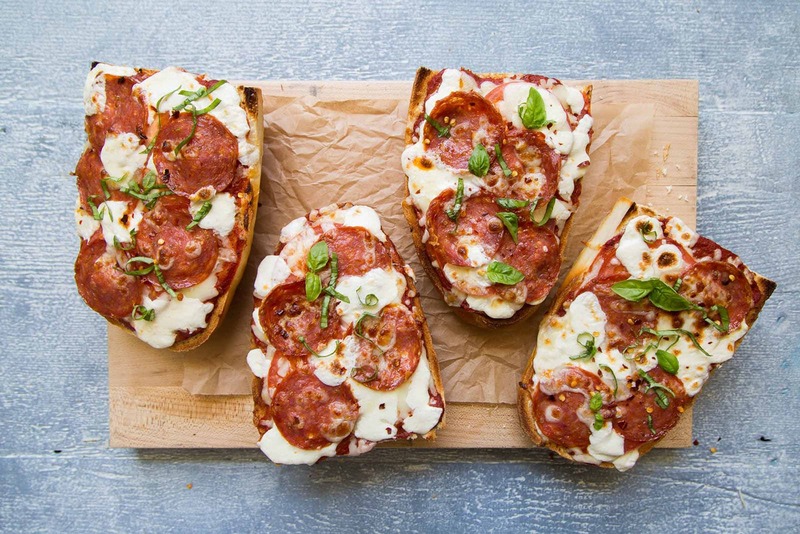 Plus, it’s way to elevate French bread pizza and make it a tad more classy. Return to the boiler for a minute or so until the cheese has melted and is starting to brown. Season with some crushed red pepper flakes and top with fresh basil. That’s it! Doesn’t it look a 100 times more better than the frozen ones? While I’m a fan of more sophisticated pizzas like ricotta and squash blossom pizza or fig prosciutto pizza with balsamic glaze, I’ll always have a soft spot for my first pizza love- pepperoni pizza! Position rack in center of oven*. Set oven to broiler. Slice bread loaf in half crosswise and lengthwise until you have four pieces total. Arrange bread cut side up on a baking sheet. Place under broiler for 30-45 seconds until tops of bread are lightly toasted. Remove from oven. Spread about 2 tablespoons of pizza sauce over each piece of bread. Sprinkle about 1 oz of shredded mozzarella over sauce. 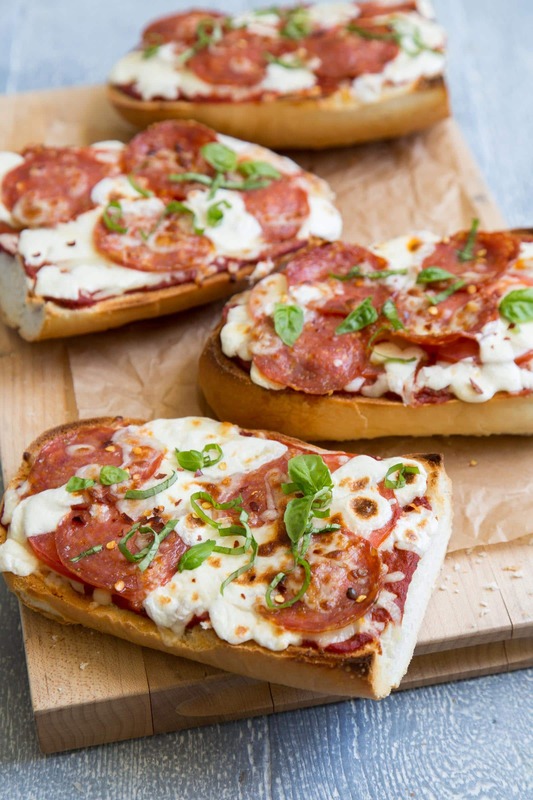 Top with sliced tomatoes and pepperoni. Crumble fresh mozzarella over tomatoes. Sprinkle remaining shredded mozzarella on top. Return to oven and place under broiler for 45-60 seconds, rotate baking sheet, and heat for another 45-60 seconds until cheese has melted and is starting to brown. Season with crushed red pepper flakes, if desired. Garnish with fresh basil. Serve immediately. Position rack in center of oven about 6-inches from broiler. The broiler setting is very HOT. Keep a close eye on your pizza to make it sure it doesn't burn. My husband and I make pizza all the time but I never thought about making it on frenchbread. OMG my pregnant self needs these in my life!! what a great idea, and easy to customize for each person! I could eat pizza everyday. So easy and yummy! Thanks for the recipe. One of my favorite ways to have homemade pizza!! 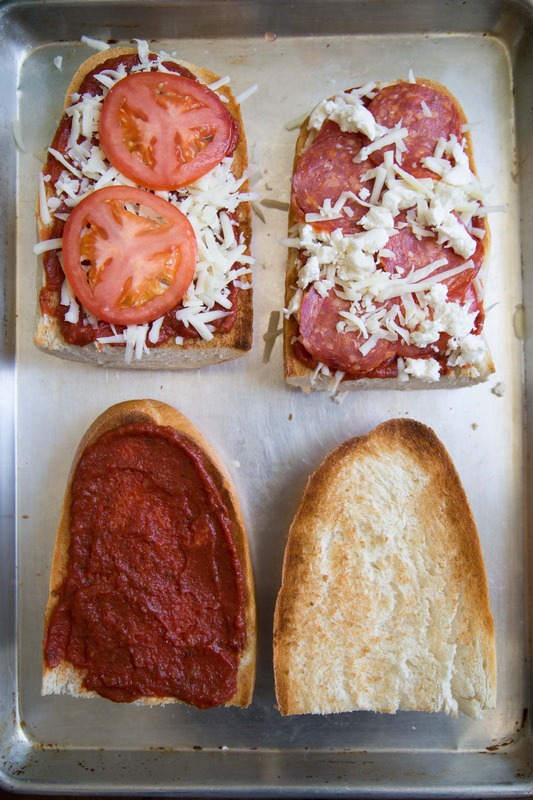 I love pizzas prepared this way, I almost prefer the French bread over traditional pizza crust! This is such a brilliant idea! Making these this weekend! They look delicious and I can’t wait to try! 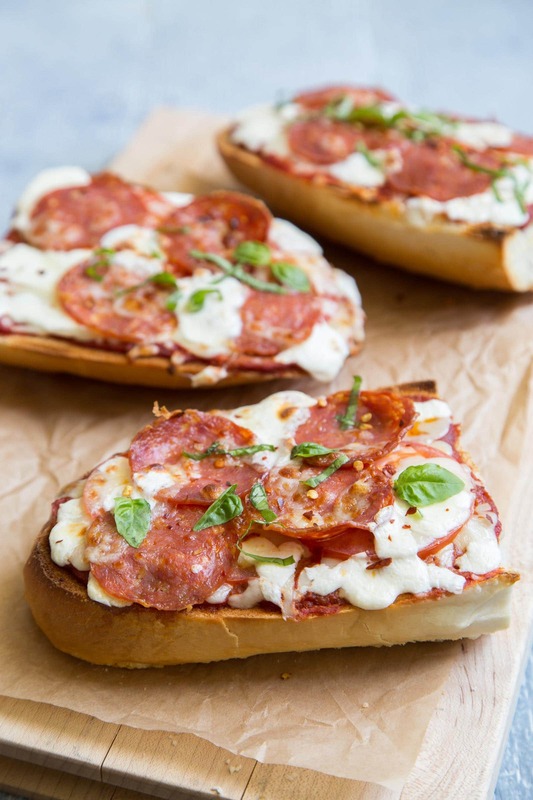 French bread pizza is definitely my go-to for dinner on lazy evenings! :) In fact, I think I just may be making it this weekend. We usually have pizza night once a week, and I know my kids would love this pizza! It looks 1000x better than the frozen ones. I wish I could smell it through my computer right now! So, simple, so easy and so delicious! This is perfect for a snack or a quick dinner!